A Boeing 727 cargo plane, operated by Aerosucre Colombia, was destroyed when it crashed shortly after takeoff from Puerto Carreño Airport in Colombia. One of the six crew members survived the accident. The aircraft arrived at Puerto Carreño at 14:48 hours local time after a cargo flight from Bogotá. Some 20,423 pounds of cargo was offloaded and new cargo was loaded for the return leg to Bogotá. 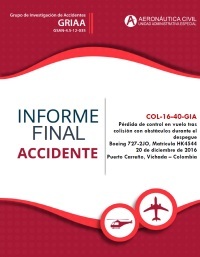 Meanwhile, at 15:00 hours the aircraft became uncontrolled as had been published per Notam. In the minutes before the planned departure, a Cessna 208 and an Embraer ERJ-170 passenger plane took off from runway 07. The wind at the time was about 010 degrees at 8 knots. Subsequently the Boeing 727 taxied onto the runway, backtracking to the runway 25 threshold. At the same time the crew worked the respective checklists prior to takeoff and made a blind radio transmission, stating their imminent departure from Puerto Carreño. The aircraft then made a 180° turn and aligned for takeoff. Flaps were set at 30°and 6½ elevator trim units were selected. The flight crew then noted that they did not know the direction and intensity of the wind. Takeoff was commenced at 17:18 hours. After travelling the entire length of the 1800 m long runway, the aircraft had not become airborne. It travelled another 95 meters over grass until it struck a section of the perimeter fence. It crossed a road, hit a shed and a tree. The aircraft became airborne, but as a result of the impact, the right hand main landing gear had separated, the trailing inboard right flap was damaged, a loss of power in engine no.3 occurred and a leakage of hydraulic fluid from System A was noticed by the crew. The aircraft reached a maximum altitude of 790 feet and entered a slight right hand descending turn until it impacted flat terrain, bursting into flames. The weight and balance manifest of the accident flight was not found among the remains of the aircraft, nor was a copy of it in the company's office. It is presumed that the aircraft took off from Puerto Carreño with 19,820 pounds distributed on 9 pallets. According to the flight plan, there were five persons on board. In fact there was a sixth person on the flight. A video posted on Youtube in October 2016 shows a takeoff of an Aerosucre Boeing 727 at Puerto Carreño Airport barely clearing the perimeter fence. Distance from Puerto Carreño-Germán Olano Airport to Bogotá-Eldorado Airport as the crow flies is 751 km (469 miles).